Are you getting honest feedback? It’s said that the only way to truly grow as a leader is to have access to candid feedback about what you are doing well in leadership and where you need to improve. There are certainly processes that have been established in many organizations to get some of that – annual performance evaluations, 360° feedback, employee opinion surveys, executive coaching – but what steps can you take on your own to ensure that you are getting honest feedback? This Harvard Business Review blog post by Dorie Clark offers up a few pointers for proactively getting the feedback you need, like conducting your own 360° review (if your organization does not offer it and you don’t have an executive coach) and holding a focus group of your friends and colleagues to hear their views on your strengths, weaknesses, and opportunities for development. Know thyself – Commit to staying on a path of self-awareness. We are all works in progress. Taking personalized assessments (such as DISC®, Conflict Dynamics Profile®, Myers Briggs Type Indicator®, etc.) to understand our behavioral style, preferences, tendencies in conflict, listening approach, etc. is an excellent way to reveal how we may be perceived by others. In addition, books such as one of our favorites, Leadership and Self-Deception, provide tools and concepts for learning more about ourselves. 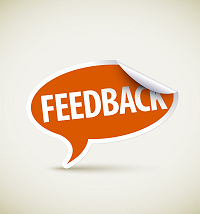 Encourage feedback – It is not easy to give someone constructive (or negative) feedback. It can be uncomfortable, especially if that someone is in a position of authority. To get the feedback you need, you have to encourage and invite feedback from others so they know it is OK to be honest with you. This ASK FOR IT model offers tips on how to do that. Be open to feedback – None of these tips will matter if you are not able to hear and act on the feedback you receive. Getting defensive, pointing fingers, rationalizing your behavior, discounting others’ opinions, and becoming angry will guarantee that the next time you ask for feedback you won’t get honest feedback, or for that matter, any feedback at all. Practice Thoughtful Leadership™ – To truly focus on your personal and professional development as a leader takes time and thought. Incorporate regular periods of self-reflection and focus into your weekly schedule, so that the busyness and demands of day-to-day work responsibilities do not present an obstacle (or excuse) in your quest for honest feedback. How do you get the honest feedback you need? Who gives it to you and why? Please leave a comment to tell us. To begin getting the honest feedback you deserve for your leadership development, contact Robyn at rmcleod@chatsworthconsulting.com.